Theodore Roosevelt believed in God and believed that people needed to read every-book they could get their hands on, including the bible. “A thorough knowledge of the Bible is worth more than a college education”. Roosevelt’s beliefs were based on his viewpoint that if you were not God-fearing you might consider yourself above the laws of man. Roosevelt was a regular church goer, having been raised in the Dutch Reformed Church. The Dutch Reformed Church went with migrants to the Americas, beginning in 1628 in New Amsterdam. “When I first came to Washington, I did not know there was any Dutch Reformed Church there, and went with my wife to the Episcopal Church. But, on becoming President, I learned that there was a little obscure, red brick building tucked away on the back of a lot, and I immediately selected that as my Church. Roosevelt was involved with an Episcopalian denomination in Brazil during his travels to that country, and by the time he had largely retired from public life in Oyster Bay, Long Island, he was a regular attendee, with his wife, at an Episcopalian church there–the “Christ Church of Oyster Bay.” They still list Roosevelt as one of their former parishioners. 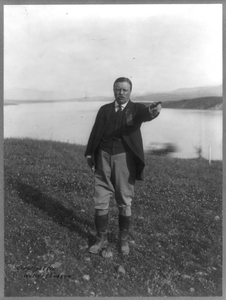 Roosevelt, like many of the time had bias as to how he saw the world and of course his spiritual views contributed to part of the complex man he was. He believed you could clearly see God in the manifest of nature, and that certain places on earth, such as Yosemite and The Grand Canyon were perfect examples of things that could only be created by God.